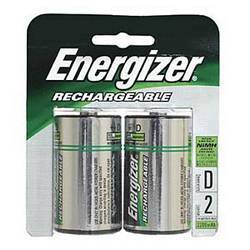 Energizer's NiMH rechargeable D battery can be recharged hundreds of times, do not contain toxic cadmium, and are the most economical battery type to recycle, making them better for the environment. This rechargeable D battery can be used with hand-held games, portable CD players, flashlights, portable stereos and more. Each battery weighs only 2 oz.